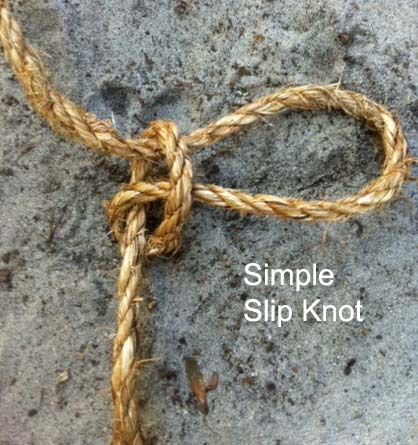 The method applied here is very similar to tying the old fashioned Slip Knot where you make an overhand loop, reach through underneath, grab the standing part of the rope and pull it through. In the process of making a rope ladder, after pulling the standing part through, stick the ladder rung inside the new loop you just formed. Tying the Marlin Spike Hitch in this manner assures you will have the part of the hitch with the knot under the ladder rung. Depending on the diameter of the short spars, to space the ladder rungs about a foot apart, make the next overhand loop about 15 inches away from the previous rung. It’s easy to adjust the position of the rungs by loosening the Marlin Spike Hitches and moving them with the short spars up and down on each side until the desired distance between the rungs is achieved and they are nicely horizontal and perpendicular to the ropes. 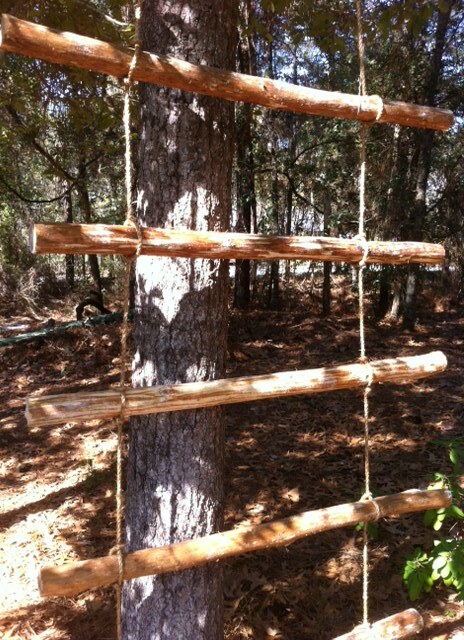 Then, give the rope on either side of the rungs a good pull to tighten the hitch back up. When tying on the rungs, start at the top of the ladder. For a shorter ladder, you can attach the ropes to their anchor point and tie on the rungs vertically. For a long ladder that needs to be prepared before attaching it to the top anchor points, construct the ladder on the ground. When the ladder is completed and attached at the top, don’t forget to tie it off at the bottom, which will measurably increase stability and the ease of climbing. This can be done by driving in a pioneering stake in line with each rope at a 45° angle. Pull the ropes taut and tie them to their respective stakes with a roundturn with two half hitches or a rolling hitch.